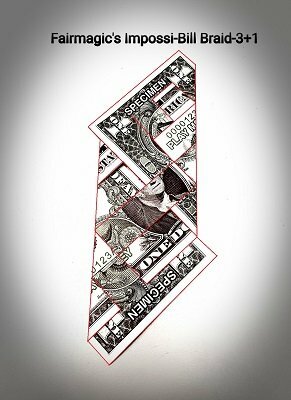 Years ago Robert E. Neale came up with his method on how the make an impossible gift out of a borrowed banknote using three strips and a few folds. Now it's time to bring this idea to the next level by using four strips! This makes the braided bill look even more impossible then before! No glue or hidden cuts. Make this impossible object right under the nose of the audience. Even if they look very close, they can't rebuild it. Note: The folding technique of Robert E. Neale's version is totally different and uses "only" three strips.